A key historic sign of distressed currencies headed toward collapse occurs when governments enact currency control laws to prevent their people from moving wealth out of that currency. In essence, if the ship is going down, they want to make sure everyone goes with it. Mark Nestmann (www.marknestmann.com), author of “The Lifeboat Strategy,” details the emerging monetary battle we’ll witness as people worldwide realize the US is no longer a safe place to do business. Two weeks ago we interviewed attorney Charles Stimpson from the Heritage Foundation (www.heritage.org) regarding the National Defense Authorization Act, which appears to authorize the indefinite military detention of American citizens suspected of terrorism without due process. Connected to that was the issue of many Americans being prosecuted and convicted each year for silly crimes they didn’t even know were crimes. Law enforcement expert Steve Doran (www.shilohtv.com) returns to challenge what Stimpson said two weeks ago. John’s boralogue examines the European monetary crisis in the light of the philosophy of the French Revolution and why it’s just one in a string of two-hundred year old failures. The Death of the Dollar: What Does It Mean? 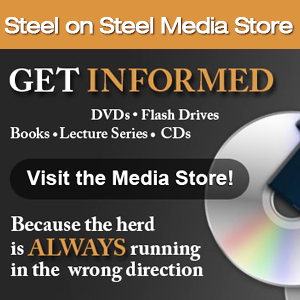 Give the Gift of Steel on Steel!